"U.S. President Barack Obama speaks at Ellicott Dredges, a manufacturing facility, on May 17, 2013 in Baltimore, Maryland. As part of his 'Middle Class Jobs and Opportunity Tour' President Obama is also visiting an elementary school and community center while in Baltimore." 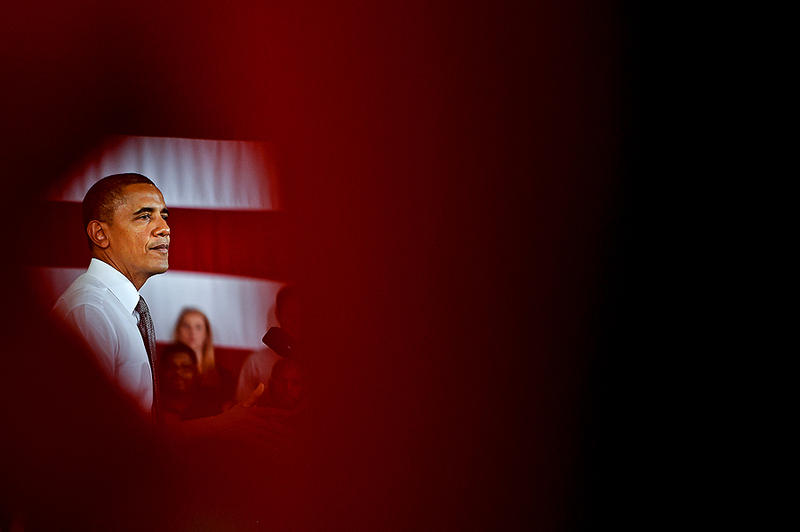 Last week, I had the honor to photograph U.S. President Barack Obama speaking in Baltimore, Md. While I'd love to photograph politics, I don't get to cover President Obama that much. I think in my time shooting, I've only covered maybe a handful or more of assignments related to our current leader of the free world. So while documenting him has been brief, I do know that security is tight and scheduling usually means waiting around a long time. It also means that positions to photograph from are limited and not always the best. In President Obama's tour to Baltimore, there was only one third of his travels that was open to general media (the rest was open to the traveling press pool). That event was at Ellicott Dredges, a manufacturing facility near the stadiums downtown. Space was limited and we were told to stick to the riser in the back of the plant. However, to our surprise, we did get to roam a very little bit. One of the sayings amongst photographers is that documenting politics is a lot of the time a game of inches - meaning everyone is shooting the same thing and even a couple inches one way or the other can provide the better angle. In an attempt to try and stand out with my images, I found another member of the media with a red shirt resting with her hand on her hip ever so briefly. I was able to get a couple frames off before she stopped resting. Nothing amazing, not even a great moment, but a small victory in working hard to find an image no one else had documented that day. 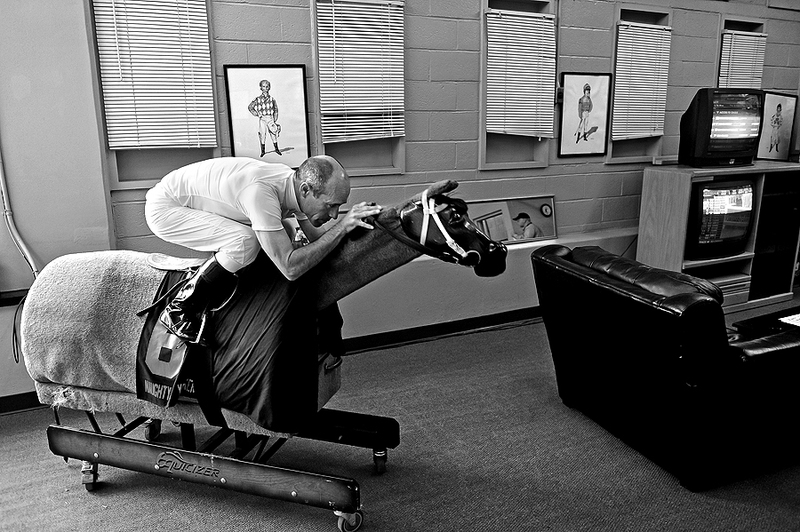 "Gary Stevens, jockey of Oxbow, warms up on a mechanical horse prior to the 138th running of the Preakness Stakes at Pimlico Race Course on May 18, 2013 in Baltimore, Maryland." This past weekend, I had the opportunity to document the 138th Preakness Stakes at Pimlico Race Course for Getty Images. Each year, this day gets more and more difficult. While the familiar charm radiates from this old racetrack, as a photographer you never want to be redundant with your images. Sure, the race itself will always change, story lines will never be identical and you can never predict how a horse will run a race. However, shooting features that tell the story of the day - infield revelers, fashionable fans, others races, and more - can looks the same year in and year out. This year I tried to look at the day in a different way and followed my curiosity to places no other photographers were venturing. I felt that my images of the day were very much different than years past and was very happy with my take. But as in any team-based assignment, I couldn't have done it without the talented Getty Images team. Every time I shoot an event with a team of inspiring friends, photographers I want to edit the entire day's take from everyone and share that. From each and everyone's hard work, wonderful visions and images, to laughs and pushing one another - it's always fun. With that, I firmly believe if you're having fun and have the support of your teammates, editors while working hard, good images will come. After a long day of wet, dark weather, Gary Stevens, jockey of Oxbow, won the 138th running of the Preakness Stakes. Stevens, a 15-1 odd, rode Oxbow to a Preakness victory, crushing the dreams of a Triple Crown for the Kentucky Derby winner, Orb. 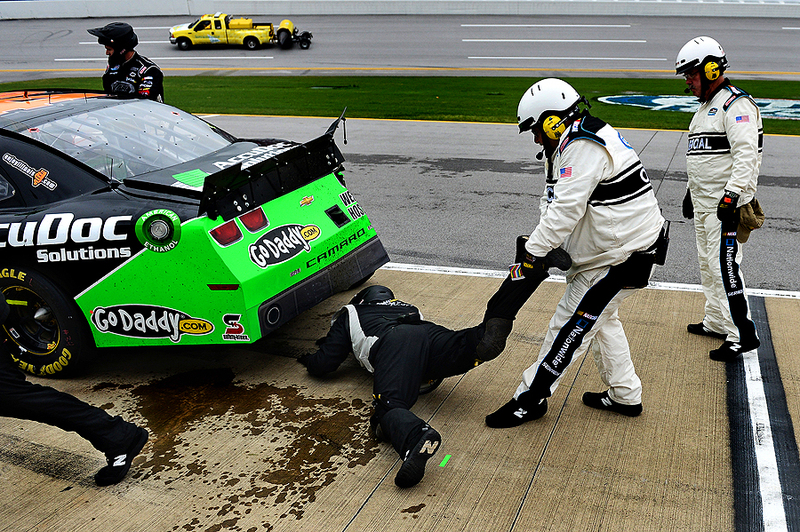 "A NASCAR official pulls a crew member the #34 AccuDoc Solutions / GoDaddy Chevrolet driven by Danica Patrick (not pictured) out from under the car due to a safety concern as the crew member was inspecting damage on the car in the pits during the NASCAR Nationwide Series Aaron's 312 at Talladega Superspeedway on May 4, 2013 in Talladega, Alabama." This past month, I was on the road shooting NASCAR at three different tracks. Every assignment I shoot is a challenge in some regards, but nothing has been quite as difficult as trying to understand and document the world of stock car racing - and I've shot a handful of races since moving back east. I am not a motorsport fan, but my interest continues to grow for the left turning sport. In part, I credit that to the extremely talented photographers, teammates I humbly work alongside at Getty Images every weekend who visually document the sport in a way I never will be able to. This sport is no different than any other - it's a team effort. Yet, images tend to be of the man (or woman) behind the wheel piloting these incredibly powerful machines. Whether in the garage or on the track, I'm never quite comfortable at the races - and maybe that's a good thing. I'm continually out of my comfort zone and looking for the extraordinary in a foreign sporting world to my eyes. Here are a few of my favorite images from the past month in Kansas, Richmond and Alabama. And as always, thanks to the amazing team for continually helping me during the weekends, especially after getting sick on the road. I'll spare that story and Kansas barbeque will never be the same. Looking forward to more races on my schedule soon.